One of the first settings you will want to learn about is the wi-fi setting. Connecting your iPad to a public or private wireless network will enable apps that rely on internet connectivity such as e-mail, youtube, and dropbox to work fully. 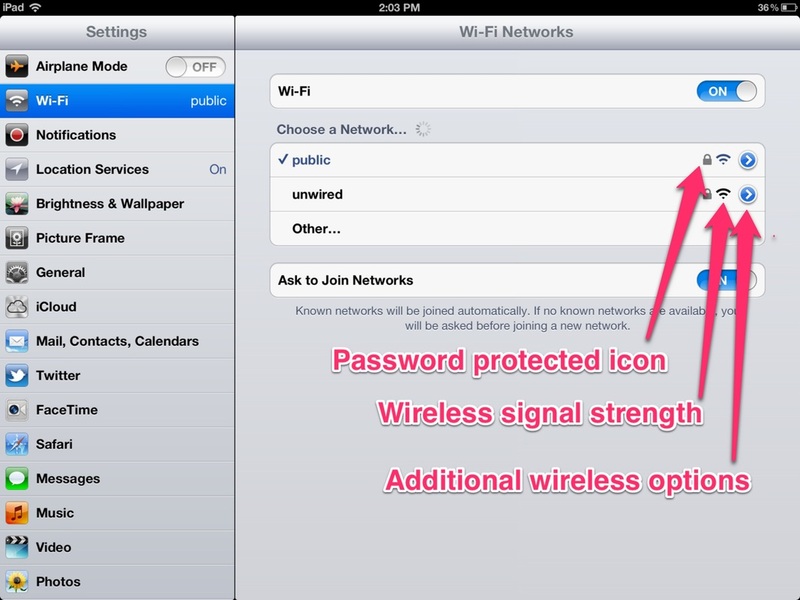 Clicking on the wi-fi tab allows you to see all of the available wireless networks within range of your iPad. You can also turn the wi-fi on or off from here. The relative signal strength of each wireless network is indicated by the number of dark bars on the fan shaped icon. Open wireless networks that are not password protected show an open padlock icon. Password protected wireless networks show an locked padlock icon. To join a network, click on the wireless network and enter the password if prompted. Connecting can take up to a minute and is indicated by the appearance of the fan shaped wireless icon on the status bar at the top of the iPad screen. Clicking on the small blue arrow icon next to a wireless network will open additional options.